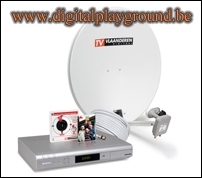 Check out the TV-vlaanderen website for more info, we have about 2500 TV-channels now ! We also have a Technisat Multitenne now, so we can view ALL astra channels and hotbird. We Also bought 2 extra tuners: SAB Titan II HD. With these devices, we can directly record video to our Synology NAS. A SmartWII system, takes care of sharing one original TV-Vlaanderen smartcard with these 3 tuners !